Looking to start a superior saw sharpening service? The Thorvie AV-40 sharpening machine does it all. With the ability to face, top and side grind saw blade from 2 inches to 30 inches in diameter, your saw blades will be better than new. It also sharpens router bits, panel and profile cutters and raised panel shaper cutters without motor interference. With over 20 adaptable tool fixtures, the AV-40 is a versatile as they come. 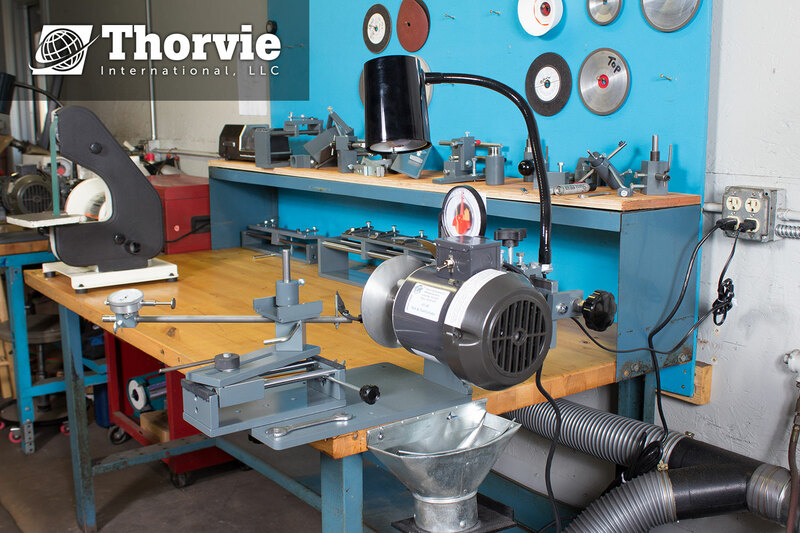 For 40 years, Thorvie International has been helping entrepreneurs like you, create their own successful sharpening service. In addition to the equipment, they provide you all the necessary tools to get you started. Business tools such as sales and marketing techniques to approach and get new customers, supply and tool vendors for new tooling, national average price sheets and more. Training aids include complete instruction booklets, training DVD’s and unlimited call in customer support by an expert sharpener himself. Hands on training can also be provided. Sharp Fest 2017, A Great Success For All Vendors. Thorvie International would like to welcomes Lin from Canada and Ross from Iowa to their team. Lin is starting a new saw sharpening service in Canada with the AV-40 saw and tool sharpening system. He also struck a deal with a local truss manufacturing company just hours after he joined the sharpening industry. Ross has a fully operational sharpening service in Iowa. He upgraded his equipment with the AV-40 saw blade sharpening machine to better serve the needs for his current and potential customers. 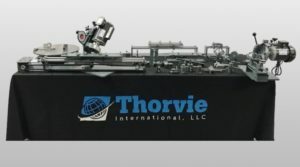 For more information on Thorvie’s world-class tool sharpening systems, or saw sharpening services, call Thorvie International at 866-497-0572 or visit the website at thorvie.com. Skill saw blades that are 7-1/4″, 24 tooth saw blades basically come in two grades. One is a contractor grade for roughly $6.00 to $8.00. Another is an industrial grade for $10.00 to 14.00. Most customers who purchase a contractor grade skill saw blade are just rough cutting lumber for home use or on the job site. They are not looking for a premier cut or finish. With the industrial skill saw blades, customers who purchase these will be looking for a better cut and finish. A lot of time they will even use them in a table saw for ripping. With the national average for sharpening carbide tipped saw blades at 30 cents per tooth, that’s $7.20. People tell me it’s not worth sharpening them. I agree to an extent but they are all worth it. The industrial blade you can see already they are worth being sharpened at about half the cost of new. I will face and top grind each tooth on this type of skill saw blade to bring back that premiere cutting ability. With the contractor grade blades, I will sharpen them for $3.50. I will either only face or top grind, but not both. This will restore the tooth enough to get the job done as the customer is less concerned on the finish of their cut. If the top portion of the tooth (the very tip) is rounded over, I will only top grind that tooth. This will grind out the rounded portion of the carbide tooth allowing it to cut nice again. If the carbide tooth has a nice point yet, I will just face grind the tooth to restore it. Some people have told me they always just top grind contractor grade skill saw blades and that is totally fine. Next PostSearching For Tool Sharpening Equipment?